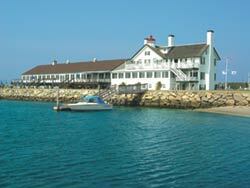 Reservations suggested.Oceanfront dining, panoramic views, spectacular sunsets, Cape Cod Charm. Breakfast, lunch (July and August), dinner, appetizers and cocktails served outside on the oceanfront deck or inside in the oceanfront dining room. Enjoy our full breakfast buffet including eggs any style and omelettes cooked to order. Lunch/Dinner menu features appetizers, sandwiches, salads, burgers, fish n chips, fresh native seafood, certified angus beef, pasta. Additional dinner entrées available after 5pm.